I read the entire Sharing Space series in a span of 4 hours…half of my Saturday. What a well worthy four hours. 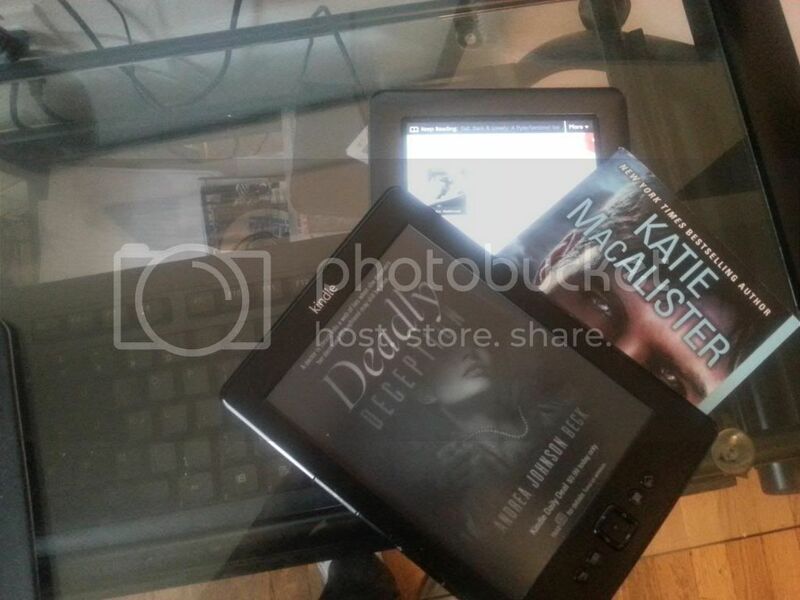 This story of Chloe Brooks, a marketing assistant and Patrick Murphy, a physical trainer/actor spans itself across six books. These six books are short in length. Right now, the first book is free and the remaining five are at 99. cents apiece. Again, well worth the $5.94 cents I spent. 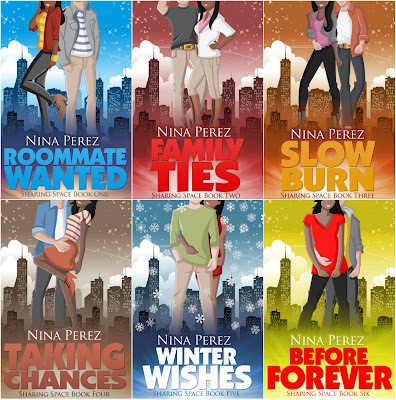 What I like about all of the books, is that Nina Perez not only kept them short and to the point. I liked how she was able to make each book deal with certain aspects of the development of the relationship between Chloe and Patrick. From book 1 to book 6, we go through Chloe and Patrick meeting one another, dealing their jobs, their attraction to each other, dealing with their family and friends feelings about their deciding to be together, a ex-boyfriend and oh so crazy ex-girlfriend, society’s thoughts on why they should or shouldn’t be together and also dealing with their own family issues as friends and as a couple. There is humor and serious issues addressed in each book. And even though Chloe and Patrick had to deal with folks and their own insecurities of being together, I loved how Nina Perez was always able to bring the focus back to them…keep the story about these two people even with the outside issues that went on. The slew of characters in this story is enough to make a series sitcom I’m telling you, Chloe’s mom, Patrick’s family and best friends, Chloe’s best friend Myra and her cousin Crystal and her daughter. Oh and her Uncle. They were all an wonderful addition to this series. Truly an entertaining series…truly an entertaining story. I absolutely loved it. 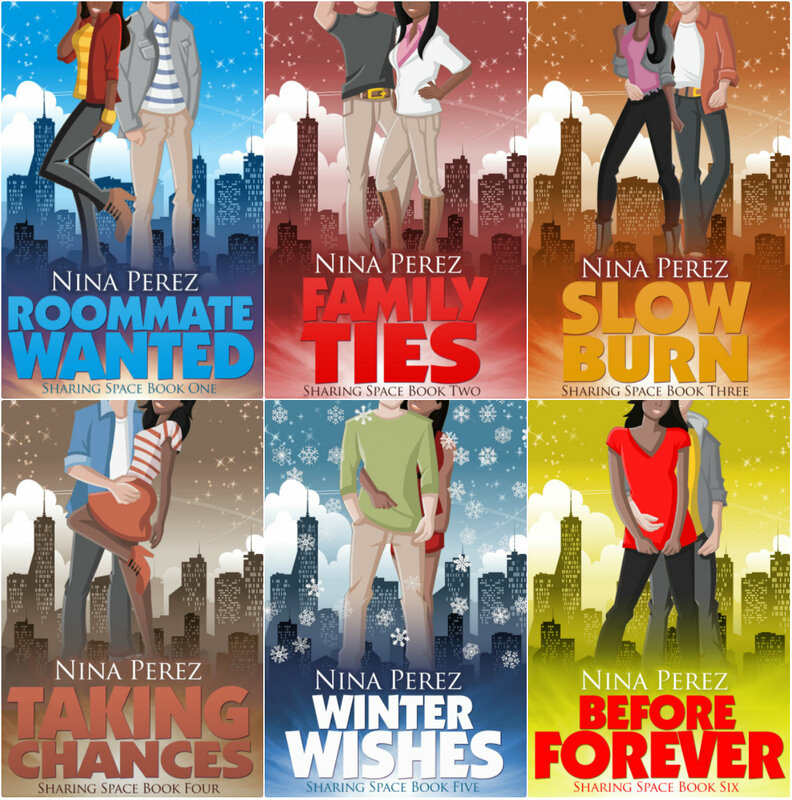 I LOL’d a lot..Nina Perez has jokes, but again she dealt with the serious issues as race, family, drugs and death…things of that nature quite well too. There was great world building, awesome character development and the story itself was totally relatable. The dynamics of a relationship can take a toll on people and when you add the above things...well, it can have two people either running screaming from one another OR it can make them stronger and fighting for what they believe is their happy every after. I like to think this is what Chloe and Patrick wanted in each other and what they fought for in a span six books. These sound great. I'm all on board with short, but worthwhile too. I like what you said about how the series addresses the issues, but the romance isn't shoved aside for them. Nice review! Definitely checking these out. Oh they do sound good. Love when an author really makes it happen and leaves out all the fluff and just gets down to the story. Will have to check them out. Thanks for the heads up Sharonda. She definitely got down to the story...just stuck with Chloe & Patrick. This really was a good series.